I’ve been taught a lesson about blaspheming Martha. After all my chastising of Living for veering away from food in recent years, hold onto your whisks, everyone… April 2012 contained the perfect recipe. And I would have posted about it in the elapsed time between now and then, but I’ve been too busy making it over and over again. Guys, I may never make anything else ever again! The magazine section involved seems to be a mad, mad mash-up of the old Cooking 101 and the (I GUESS) old What’s For Dinner, since I suppose we have to accept that the pull-out card section is now an entertaining feature. The new section is “Cooking. What’s for dinner?” or, more accurately, “COOKING what’s for dinner?” I can only surmise that the all-caps is meant to draw you in while the italics emphasize the giant hole in your heart where the good old days used to be. I must admit, my bitter tears did nothing to water down my instant interest in this new Cwfd? section. Pasta is my favorite favorite comfort food, and I would happily lie atop a bed of angel hair at night and then eat the entire thing in the morning for breakfast. This article, “Rethink Your Pasta Routine” outlined the method of cooking pasta that sticklers for genuine Italian cooking insist upon: boiling it while you make the sauce, then finishing it in the sauce skillet so that the pasta can absorb the flavors (bonus: no colander washing and you can spoon pasta water directly into the sauce from the pot instead of throwing tap water in because you forgot to save some of it before you drained the pasta, which I would NEVER do, Martha). 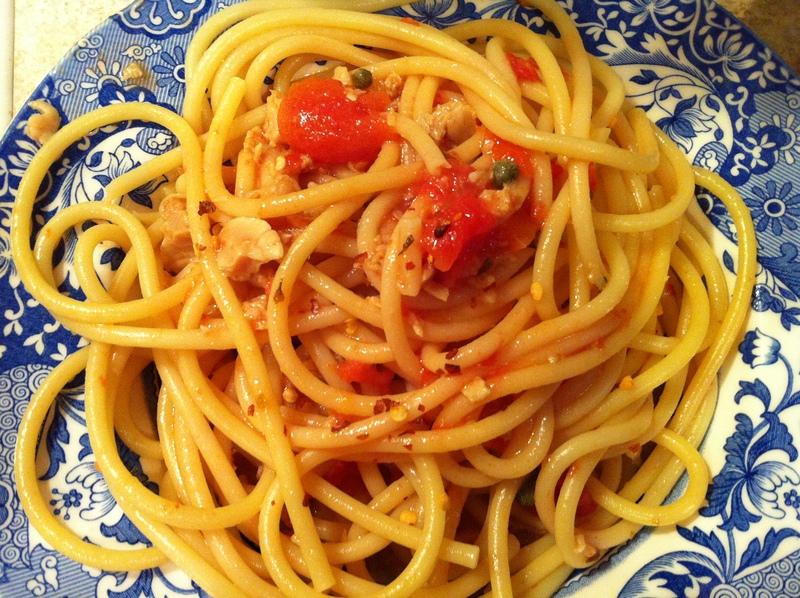 All of the recipes looked good,* but the showstopper was Bucatini with Red Clam Sauce and Hot Pepper. Here is a metric I never knew existed until recently: This dinner takes less time to make than it will take your spouse to feed the baby and put him to bed. Wait, wait, let me go one better. 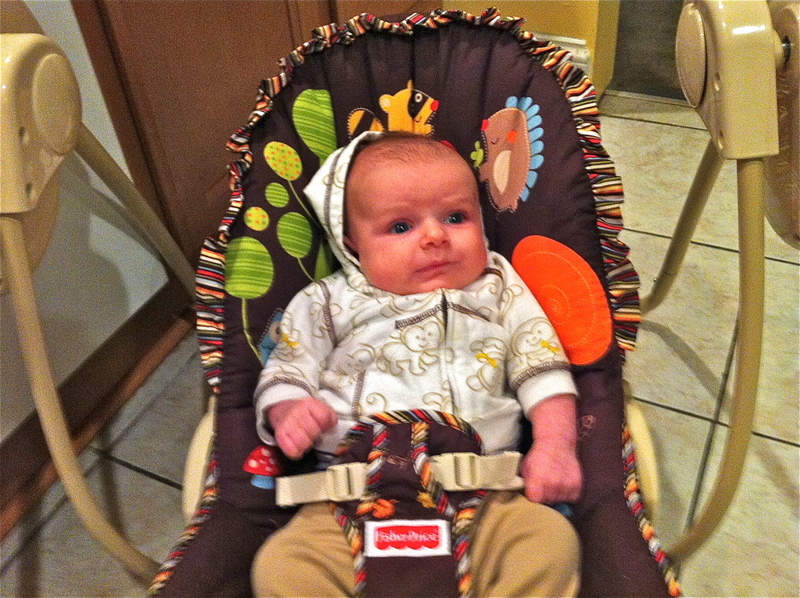 This dinner takes less time to make than it does for your very capable spouse to put the easiest baby on Earth to bed. I speak the truth! 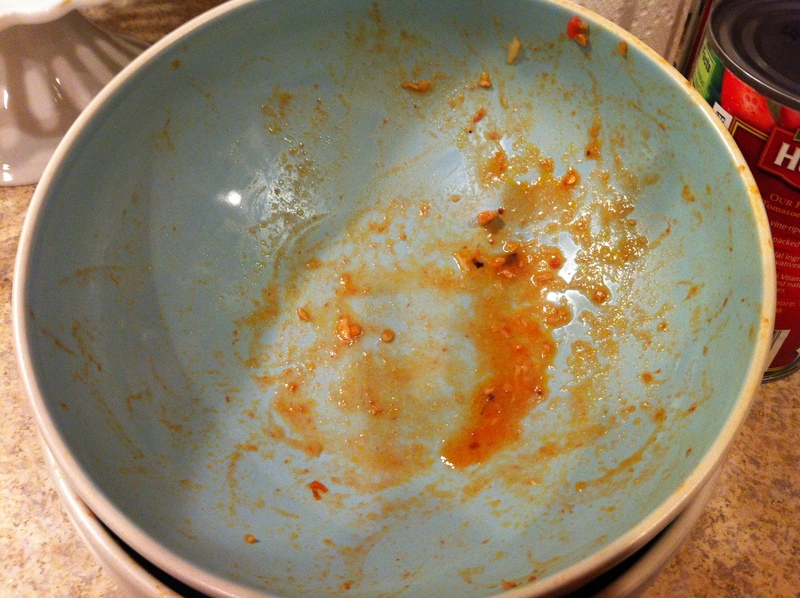 I actually had to slow down my cooking process so that this delectable dish wouldn’t be ready too quickly. Anyway, I’ve made it thrice, per my husband’s request (a rare and wonderful thing, as he cheerfully accepts everything I put in front of him and doesn’t give too much feedback). In conclusion, I have clipped this recipe and added it to my binder of “recipes I would make again,” which now contains three recipes. You win this round, Martha. 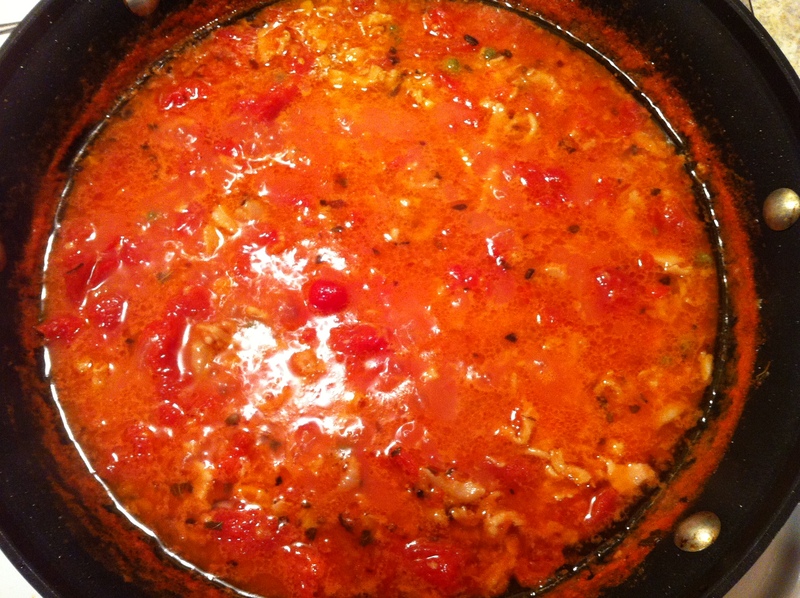 *I did try the Fusilli with Bacon, Onions, and Mushrooms, which was satisfying yet bland. ** JK. Kroger’s “Private Selection” makes perciatelli for like $0.99. It’s not the Rockefeller pasta or anything. I learned something this year on St. Paddy’s Day – it’s not cool to wear green anymore. That is, I know people who actively avoid the color on this, the Day of Many Beers, because they don’t want to be mistaken for one of the drunk jerks who amble around with neon green leprechaun hats on, enjoying the beautiful spring weather by throwing up on an azalea bush. The blondies are straightforward enough: mix up some dry ingredients, mix up some wet ingredients, combine. 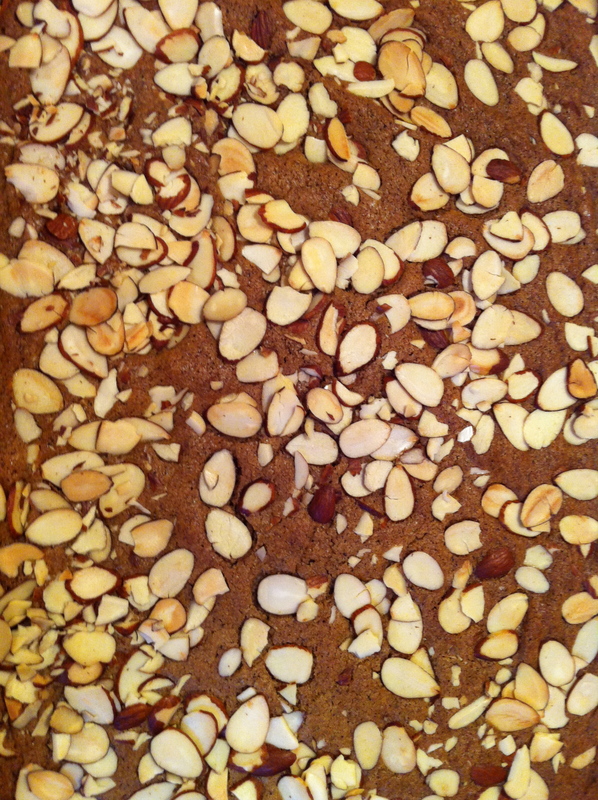 Then pour into a pan, sprinkle sliced almonds over, bake, and drizzle with a whiskey-spiked glaze. The result is intensely flavored with coffee and whiskey. In fact, they’re almost overpoweringly coffee-whiskey flavored. Actually no, not “almost,” just plain overpowering. But this could be because I screwed up. For some reason, I read “3 tablespoons of freshly ground coffee” as “3 tablespoons of freshly BREWED coffee.” So I dutifully French-pressed some joe (that’s what you coffee drinkers call the stuff, right? ), but realize now that Martha may have meant to add just the grounds. My palms are a little sweaty with anxiety that she’s up there in Bedford sitting atop a horse, holding up a hand to signal Kevin Sharkey to quit his endless prattle, and sniffing the air attentively. “Somebody,” she says to Sharkey. “Somebody has sullied my name by brewing coffee instead of scooping it directly into blondie batter.” She and Sharkey then catch, skin, and cook a rabbit over a fire before kicking back under a pink-feather tree and taking a quaint little nap. MY APOLOGIES, IRELAND. I READ THE THING WRONG. 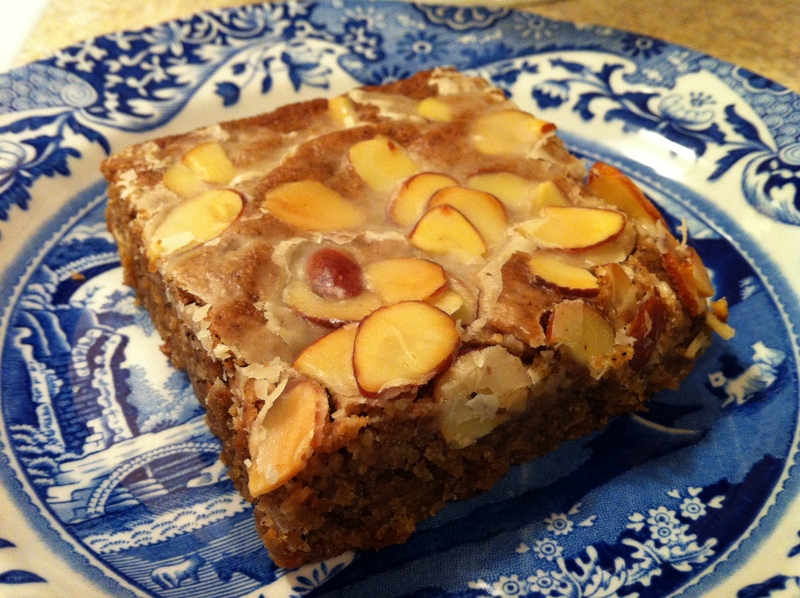 In retrospect, the brewed coffee could have intensified the flavor – and probably did – but the blondies were nice and moist in the end. When it was glaze time (confectioner’s sugar + whiskey), I followed instructions to a T, but nothing would drizzle. It would only pour. So I poured it and spread it all over the blondies like a proper glaze. Nobody noticed the difference. The blondies were a big hit with whomever came across them, but we discovered that an extra day of chillin’ at room temperature in plastic wrap was just what the flavors needed to mellow out. I no longer felt like I was simultaneously going to (whiskey) and recovering from (coffee) a St. Patrick’s party gone terribly wrong. So put these on your list of more mature, more subtle St. Patrick’s Day treats for next year. You’ll need them for sustenance while you cower inside your home, hoping your azalea bushes will survive until March 18. For all my criticisms of Living’s constantly changing format and continual decline in number of recipes, the March issue was, I have to admit, pretty great. This time around, the annual Gardening Issue*, contained a bunch of delicious recipes! Who knew? I thought we’d be knee deep in a trillion varieties of bluebells and suffering through endless descriptions of Martha’s elaborate gardening setup. My thumb doesn’t even approach green. It’s more a sickly, ashamed yellow. But I imagine that for many, this issue is eagerly awaited every year. My sickly thumb and I just sigh and dream of April. But March 2012 is determined to be better than previous Marches! I applaud this! I’ve now made a couple of edible things from this issue, but the standout (and not just because it is an alcoholic beverage, although that didn’t hurt its chances with the judges, that’s for sure) is the White Nixon cocktail. 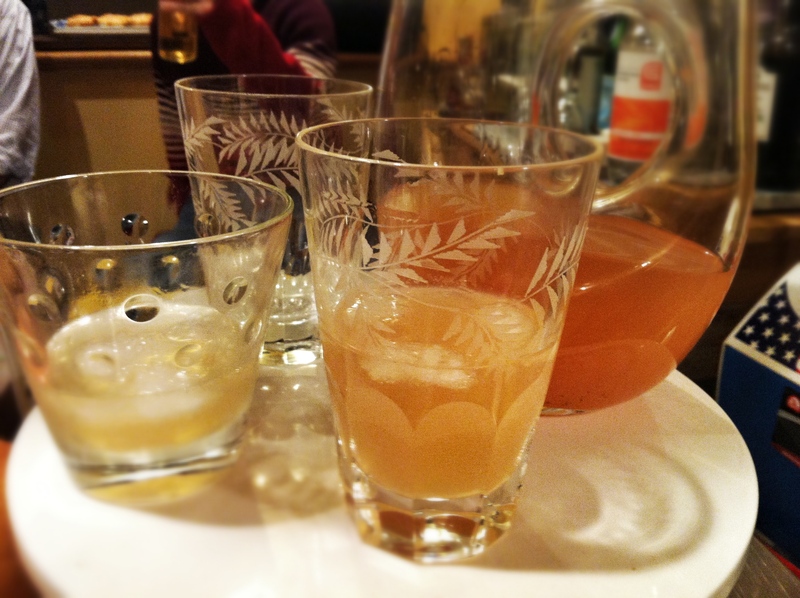 A mixture of vodka, fresh grapefruit juice, ginger liqueur, and (cold) tea, the White Nixon is basically everything I like in one glass. Oh, and it’s not just any tea. 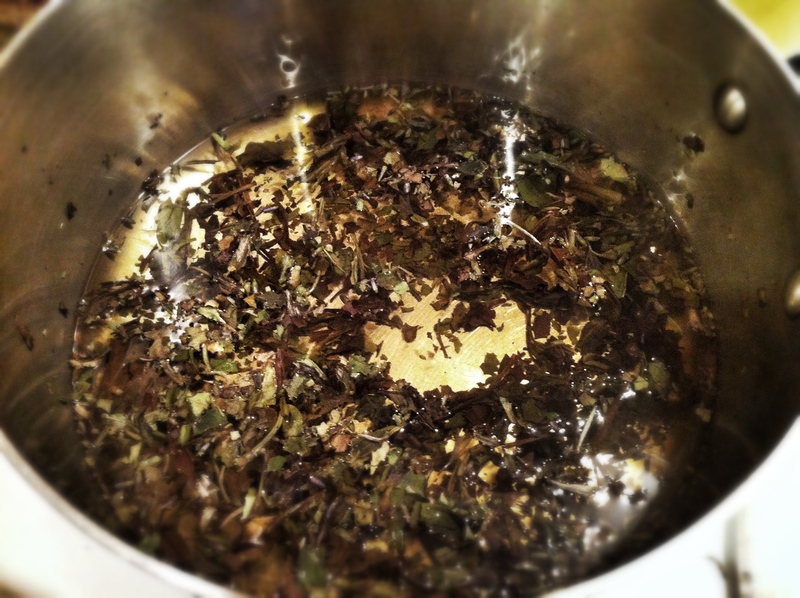 It simply must be made from the White Nixon blend of white tea and herbs from Bellocq tea atelier in Brooklyn. Every cell in my typing fingers resisted committing that paragraph to the annals of Internet history. What a prissy, snotty thing to say! “Must be made from the blend of whatever from some place in Brooklyn where nu-yuppies go to meet other nu-yuppies who want to compare notes on who’s been to what obscure Asian country and how you know Whole Foods is probably a corporate mindwasher but you just can’t pass up their Meyer lemons.” But, my friends, I just completed a nine-month tour of the Seas of Sobriety, and I wanted a cocktail that was fit to celebrate my homecoming. 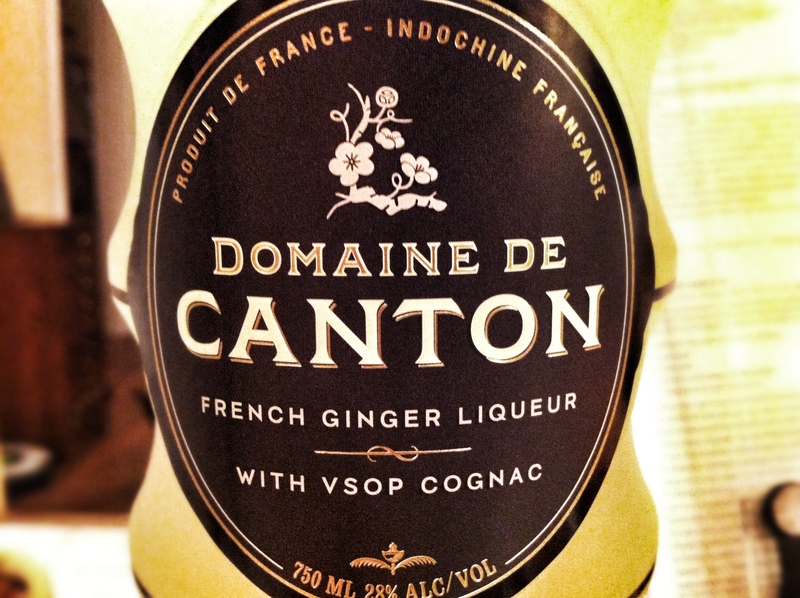 I won't go into the details, but I wasn't sure if my local liquor store would carry this. And they DO! It was a heady day. So I ordered a box of White Nixon from Bellocq and instantly developed an expensive tea habit. THEIR TEA IS SO GOOD! I think I probably hadn’t had seriously good tea before, because this tasted like subtle, elegant heaven. The article in Living explains why they’re so amazing, but to sum up: they send unicorns to the Elysian Fields to pick organic tea in small batches or something and the result is phenomenal. They sent me a sample of another white tea blend called White Wolf, which was delicious as well. White Nixon tastes a little like a lavender sachet but not cloyingly so, and the lavender is offset by a really delicate tea flavor. As you can tell, just the thought of it turns me into a wistful romantic who is probably clad in a velvet blazer. But it is that delectable. But yes, the White Nixon cocktail was tasty like a more interesting greyhound (vodka + grapefruit juice, my favorite). But honestly I’m more excited about all of the teas I’m going to discover now that I’ve found Bellocq. Teas trumping vodka. Life goes on. * The one that normally begins begging for its life the moment it drops through the mail slot and sees the “Oh, you’re headed straight for recycling” glint in my eye. ** I’m tired a lot. *** Like some babies I know. I’m a simple gal. I have a few things that I love in life. My family, my accountant (what? He’s really helpful), and the What’s For Dinner? Section in Martha Stewart Living. It’s a themed meal of four distinct dishes (usually an appetizer, a main, a side, and a dessert). Each recipe is printed on a handy card adorned with typically beautiful Martha photography, and, best of all, there’s a little guide that instructs easily flustered people like me in the subtle art of orchestrating a meal. That is, Martha tells you when to start each step so that you end up with a meal that comes together so cohesively, your guests will marvel at your calm, unsweaty composure. At least that’s the idea. 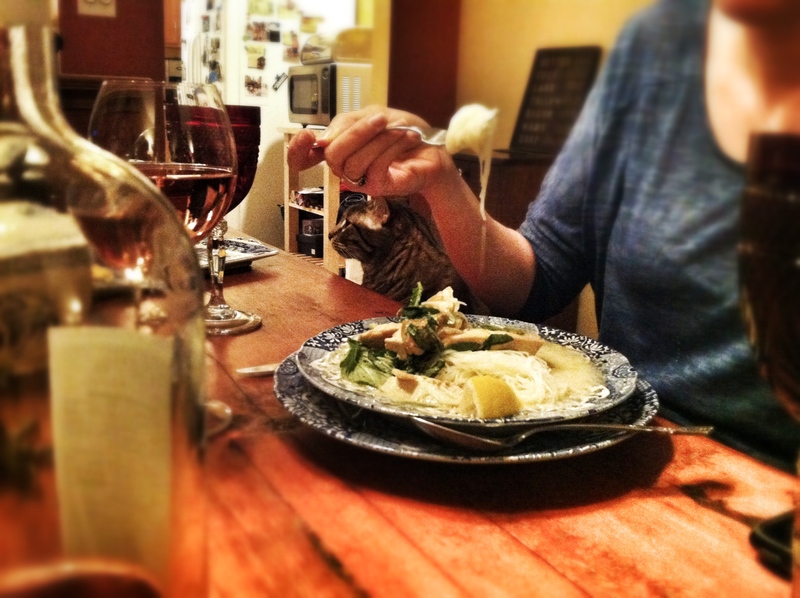 As you know if you’ve read our blog before (may I direct you towards past posts to your right?? 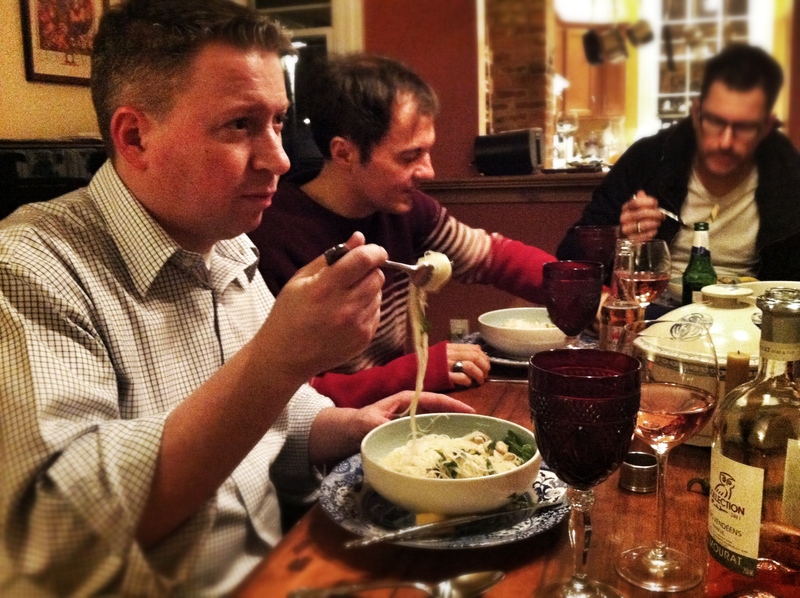 ), the “meal for four in about an hour” rarely takes less than two hours. And no one is ever composed. We’ve had a fair amount of success getting everything onto the table at the same time, but it does take two of us, with our spouses tending bar. And we’re ALL sweaty. But it’s a beloved ritual all the same. So when the January issue threatened to RIP MY HEART ASUNDER with a dreaded Formatting Change, I tried to remain cool. What’s For Dinner? had been sullied! A French meal complete with French table stuffs – all for sale of course, on the next page. What! Where is my unsweaty composure guide? Where are my beautiful detailed dessert photos? What is this catalogue of supreme preppiness? I do have other things to worry about, it’ll surprise you to know, so I forgot about it until February, when What’s For Dinner became a “ROMANTIC MEAL FOR TWO!” Romance! Who needs it!? I want a kitchen full of Martha jokes with my sister, and I want dudes tending bar! 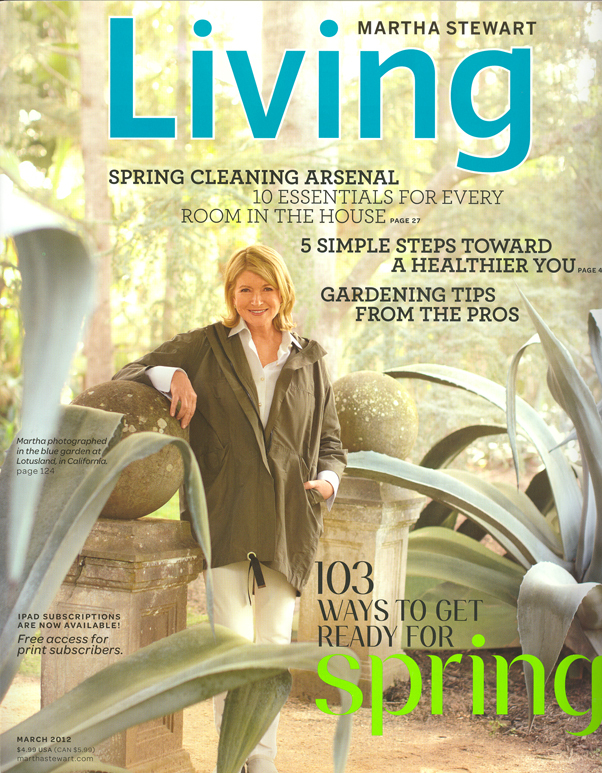 Naively, I awaited the March issue. You can make this stuff in about an hour IF you follow the handy guide (RIP), make the granita ahead of time, and get the chicken marinating. The soup, the toasts, and the chicken (once it’s marinated) are quick and easy. 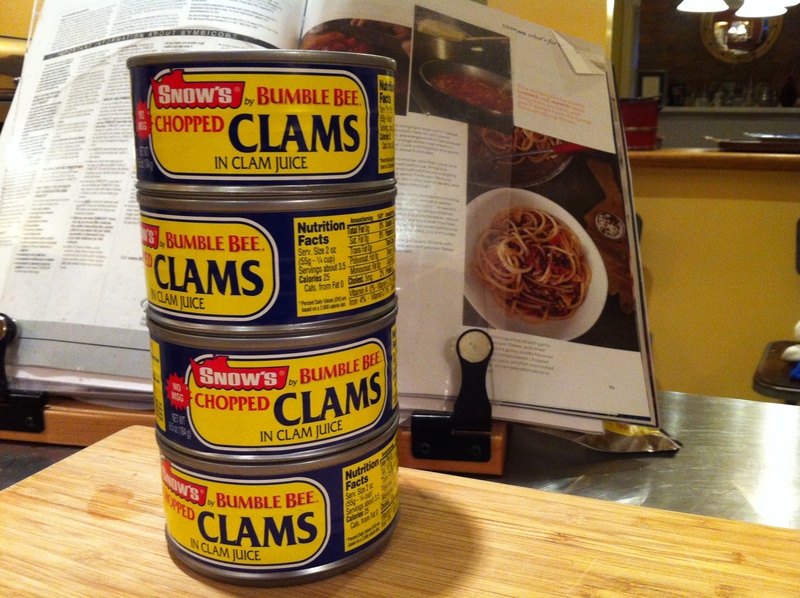 If you’ve always wanted to grind up raw shrimp, now’s your chance, soldier. 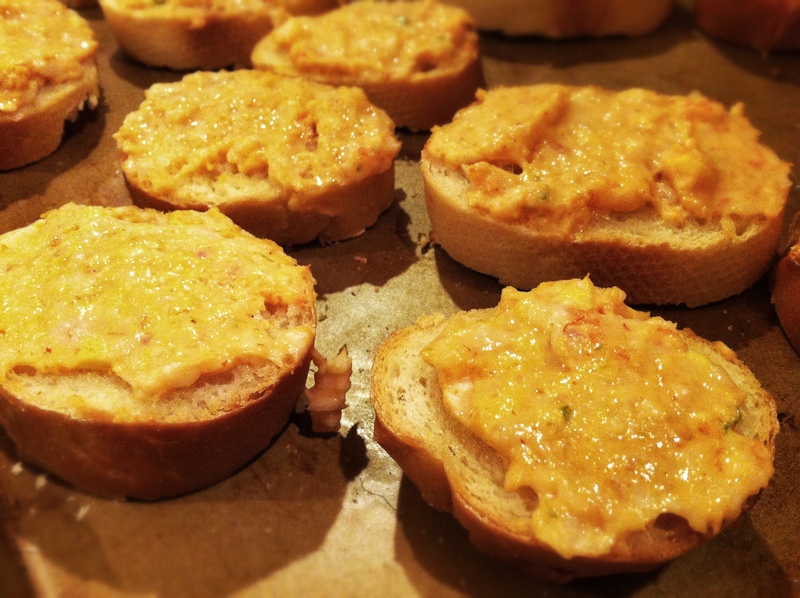 For the shrimp toasts, whip a bunch of stuff (including the shrimp) in a food processor, spread it on baguette slices, and broil. Then try not to eat 50.
Who you callin' shrimp toast? …Right now! The Coconut-Curry Noodle Soup is just a jar of Thai curry paste (supposed to be yellow, but I used green, as I am a human being without supernatural access to these things), some broth, coconut milk, noodles. 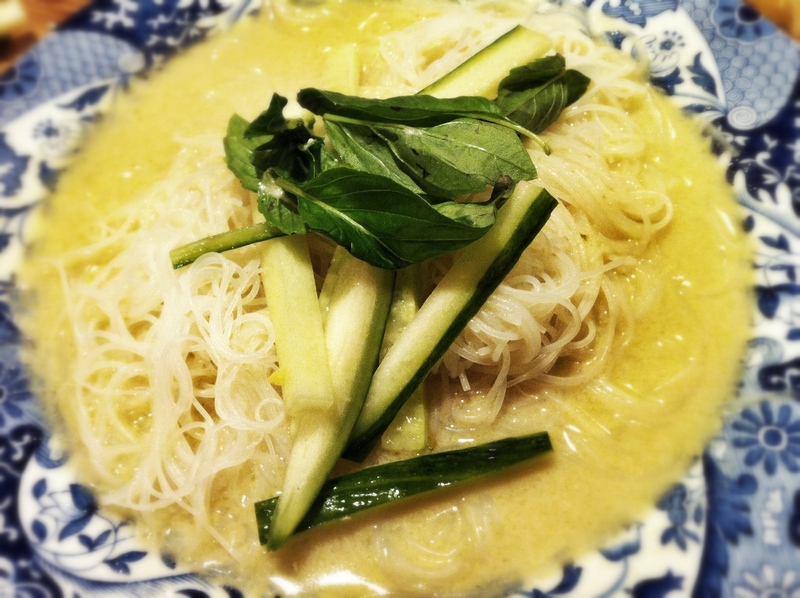 I used rice noodles because I love them, but I got wayyyy too much. One package is plenty. I also used about 30% too much coconut milk because I wasn’t paying attention (there’s a reason for that in the post directly following this one), but no one seemed to mind. And now, the coup de gras. 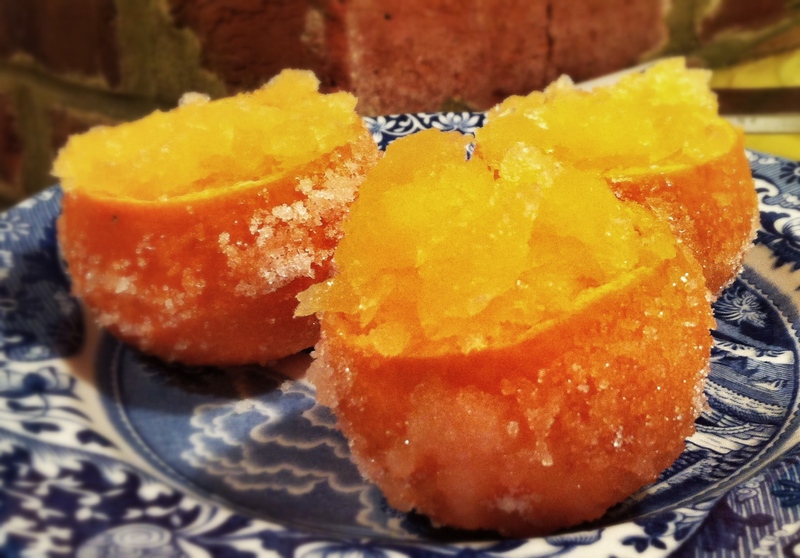 Clementine granita in tiny adorable cups made out of the bodies of dead clementines. You will need an entire carton of clems, and you will need to set aside some time. It’s not as hard “removing the flesh from a halved clementine” as you might imagine. Clementine peels WANT to come off of the flesh. I used a sharp knife to cut around the inside of the peel, then just sort of stuck a fork in there and pried it out. Many times it just came all out at once. I'd love to promise a happy ending for all of these clementines. 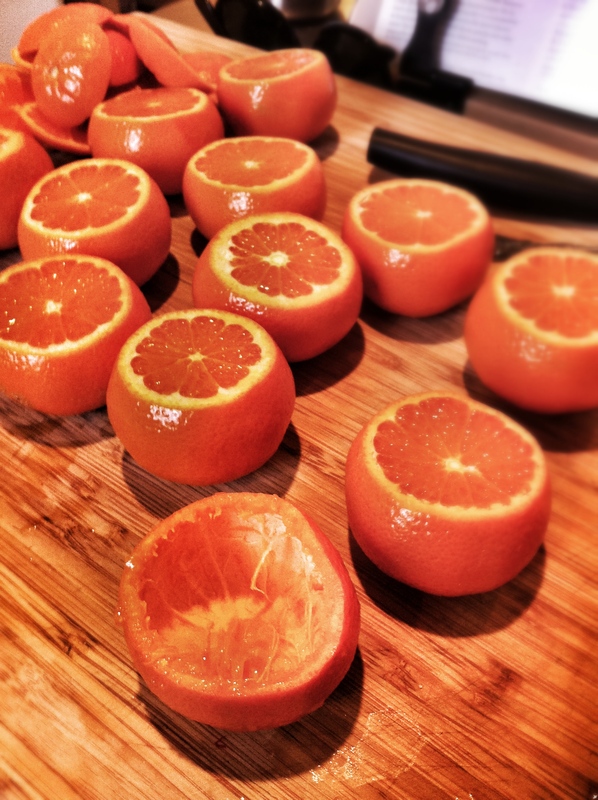 When you’ve left your naked and humiliated clementine flesh in a strainer and attempted to squeeze as much juice out of it as possible, you’ll still need to juice about a million more clementines to get the amount of stuff you need. Do not lose heart. Your efforts will be rewarded. Roll the peel-cups in sugar, stick them in the freezer. Mix the juice with some other things, stick that in the freezer too. Proceed with your dinner-making, then, three hours later, rake up the granita with a fork and jam it into the cups. Arrange on a plate and smile smugly, because you’ve just created something beautiful, healthy, and delicious. The What’s For Dinner section valiantly saluted its own demise with this December 2011 iteration. We can all learn a thing or two from its bravery. (If it’s just one thing, I recommend learning the shrimp toast). *It’s a BEER-TASTING DINNER, OK? Everything is FRIED and BROWN and BEER KEEPS GETTING MENTIONED. What am I? Tailgating? It’s frigging MARTHA STEWART LIVING. I want lavender-scented shortbread and FRIGGING FRISEE SALADS. STOP RUINING EVERYTHING. **SOMETHING I IMAGINE IS SAID A LOT AT BEER-TASTING DINNERS. Citizens! We are BACK to ring in 2012 (a little late) with lots of promises to step up our Martha game. In our defense, it’s been a little tough to get inspired lately, what with the December, January, and February issues of Living reading as stale as yesterday’s petit fours. I keep staring at the March issue, which lies primly on my coffee table, hoping against hope that it will contain more compelling material than its immediate predecessors. I got into Living for the same reasons you did, probably: a slightly embarrassed desire to learn about the Good Things that I could be adopting in my household. Lately, Martha et al. have deemed it more fitting to offer a seemingly incongruous mixture of ridiculous party tips by Kevin Starkey, the Mad Manhattanite, and bland, heavily sponsored advice about which facial cleanser to use. Kevin and his friend, Bette, share a laugh next to one of his pink-feather trees. One of his pink-feather trees, ladies and gentlemen. And the February issue, typically rife with chocolatey goodness, brought a series of boring articles to a sweeping climax with a Marc Marrone column about how to pet dogs and cats. Did you know, fair reader, that if you scratch a cat’s head and the cat likes it, it will press its head towards you for more? I do not jest! Also, a dog, when happy to see you, will move its tail back and forth in a lateral motion! 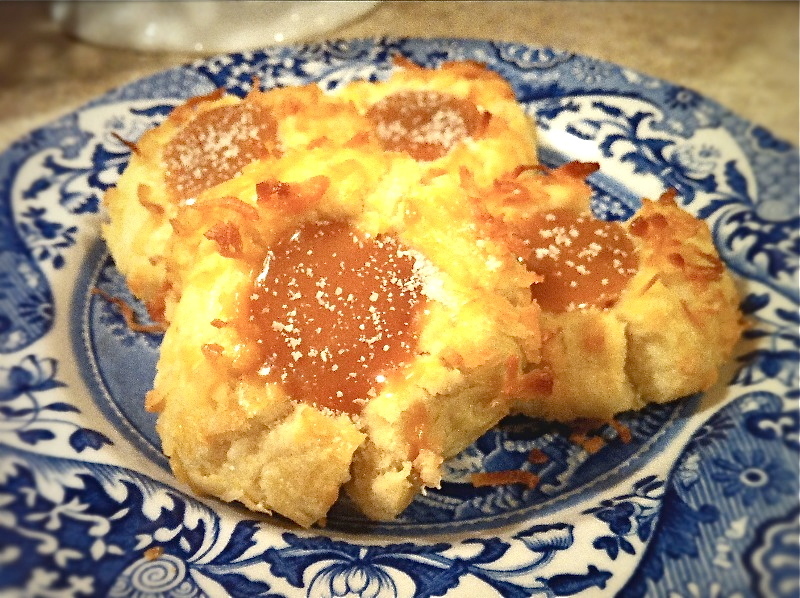 But one recipe stood out from among the meager sprinkling — Coconut Thumbprint Cookies with Salted Caramel Filling. Tucked in amongst the table of content pages as if it was something to be ashamed of, this extremely easy cookie recipe humbly pwned everything else in the issue. It’s like this. 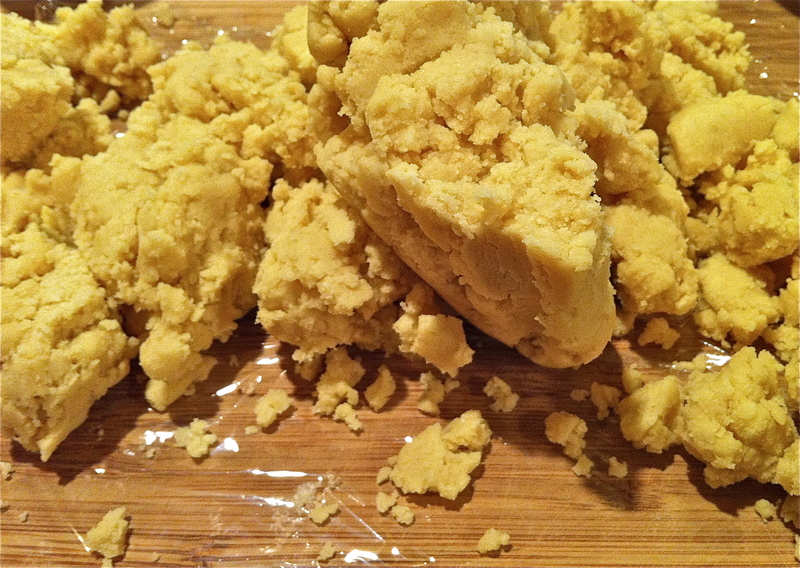 First you whip together a butter cookie dough in about five seconds. A mess that will become beauty. 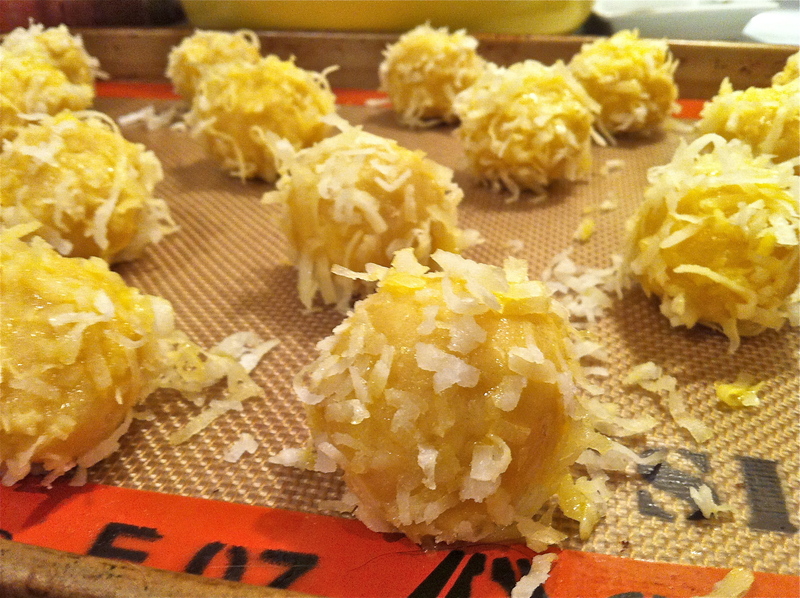 Then, you form balls and roll into shredded coconut before baking. Make little thumbprint divots. Bake. 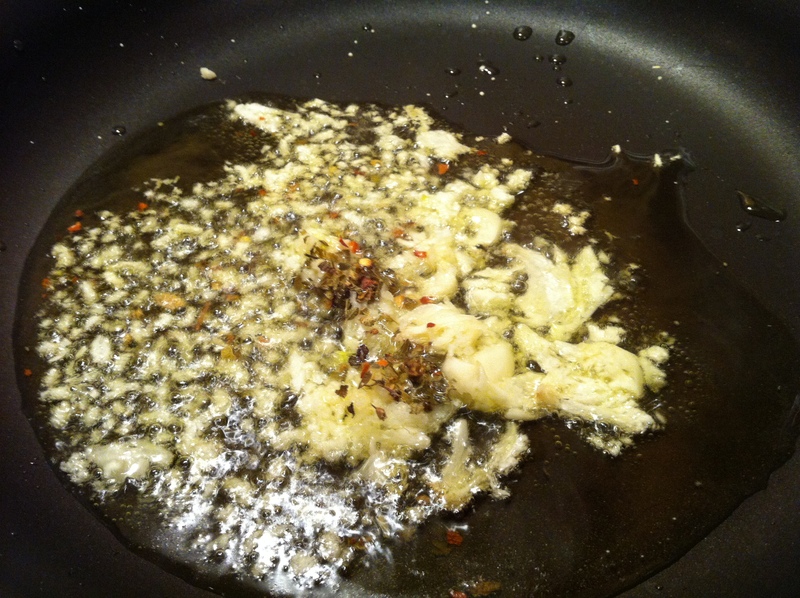 Then fill with melted caramel and sprinkle with sea salt. So effortless you can do it while your baby watches. Oh, btw, I had that baby, finally. Hope he doesn't mind how often I say "ballz." I made these for my life/business partner, Kate, on her mumble mumble-ieth birthday. She likes coconut and she needs to be fattened up, so these were the obvious choice. I can heartily recommend these for any friends you have that might need to be fattened, or just share around your feather trees at your next soiree. Martha fervor always falls off a little during summer in these parts. There’s too much to do and not enough time to do it, and also… well, it’s hot here and I get lazy. But one Marthadventure stood out as an easy, delicious, and stunning dessert that I will graciously accept as an apology for those damn cookies. If you’ve come across a late crop of zucchini, shred it up and stick it in this cake. If not, save this recipe for next year. 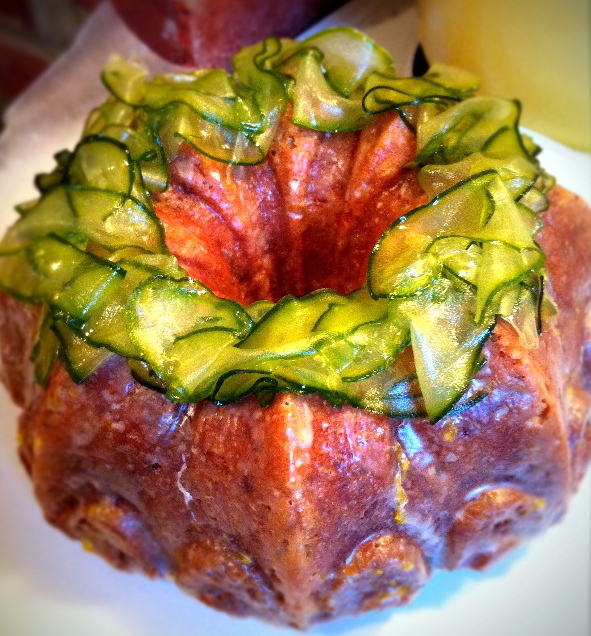 Zucchini Bundt Cake! Or as it should be called, Zucchini-Orange Glazed Amazing Heaven. I know what you’re saying. Susan, what a beautiful ruffly topping of candied zucchini! It simply must be the most delectable thing ever, if it looks so good. My tasters, lucky bastards, disagreed, and I am in their camp. The candied zucchini is actually easier to make than you’d think. Get out a mandoline (I replaced my death-trap OXO version recently with a simple plastic handheld one. It’s sharper and therefore safer — really — and I have yet to slice off part of my thumb with this one, so it’s got that going for it too) and make some nice lengthy slices, then boil them in sugar water for awhile and drain on some cooling racks. Easy! But not that tasty. Sort of a sickly sweet but still vegetabley taste that doesn’t keep well. Not that you’ll have this cake around for long, but if you plan to keep it longer than the party you’re bringing it to, I’d advise against. They get slimy and weird and the cake is good enough without them. As usual, I substituted white whole-wheat flour for the white flour. In a cake as dense as this, it doesn’t make a difference and it’s way healthier. Repeat after me: white flour has no nutritional value and barely gets to count as real food. When you can substitute a whole grain, do so. It almost always makes it taste more interesting anyway. That said, I did NOT omit the glaze, which you could do also, if you were trying to save yourself from wonderful gluttonous oblivion. 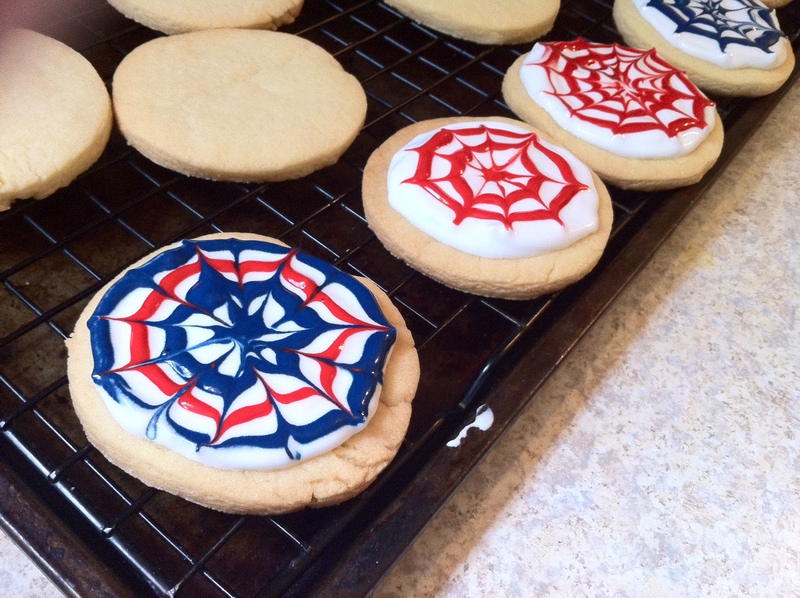 Countrymen, I royally, revolutionarily screwed up during my annual 4th of July baking spree. Each year, I spend that holiday of holidays cheerfully putting something delicious together for my friend Emily’s annual party. I enjoy the prep, I enjoy the party, I enjoy watching fireworks, and I enjoy thinking about the Founding Fathers. This year, I’ve figured out something I don’t enjoy: being tricked into crafting when I want to be baking. I'LL GIVE YOU SOME COLORS TO SHOW! 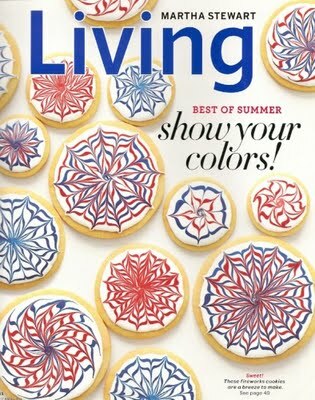 Martha’s July issue featured a bunch of cheerfully iced sugar cookies. “Show your colors!” it demanded, and I stupidly complied. 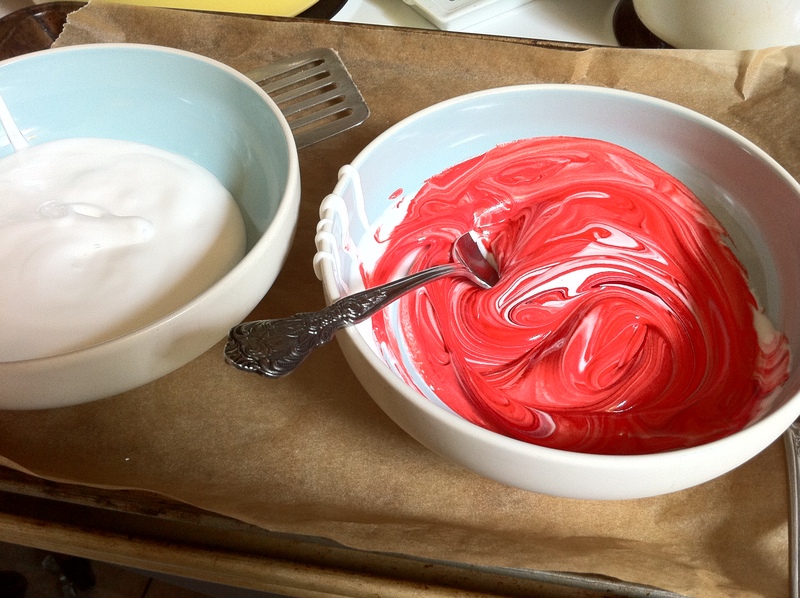 My colors are red, white, and blue, just like everybody else’s, only I am best when I display them as raspberries and blueberries scattered across meringue or something. 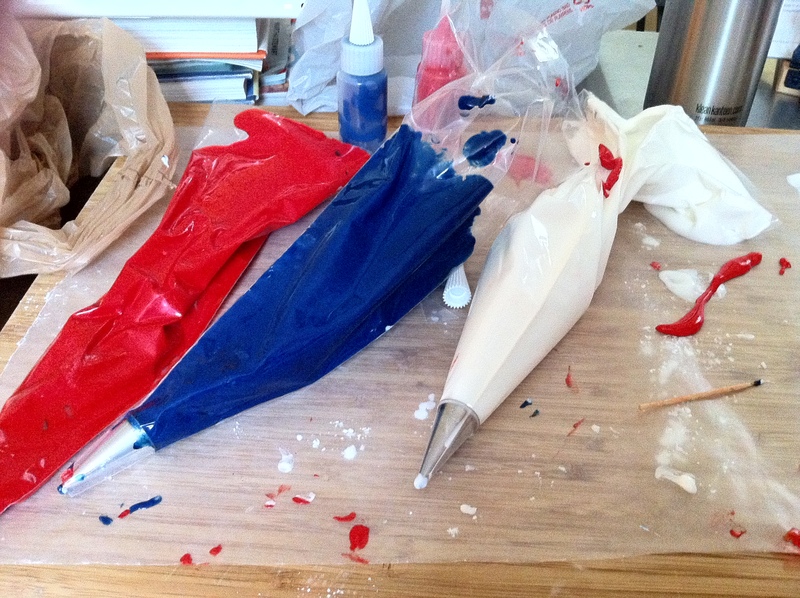 Mixing up some "Frustrating Red"
I’m never getting food at a craft store again. So gross. First of all, the sugar cookies, while easy enough to make, tasted like big, bland poker chips. But that’s OK. The appeal for these babies is in the beautiful patriotic pinwheels on the top, which are just so, so precious that everyone will overlook the fact that they are eating chemicals that taste like…chemicals. Well, not if your pinwheels look like they were the end result of an afternoon volunteering at your kid’s preschool, which is exactly what mine looked like. Only I don’t have kids, and now I’m seriously concerned about my future ability to deal with finger paint all over my house. The problem lay in the consistency of the icing, which was too thick to work in the squeeze bottles they suggested. So I messily switched to pastry bags with tiny tips, figured out they were also inadequate because of the icing’s consistency. I thinned it down as best I could, used the stuff I had left after the bags and squeeze bottles were rejected, got out new bags, filled them again, bemoaned my stained hands/countertops/baking-reputation, and watched in horror as my fireworks turned into knobbly, stupid messes. This recipe is simply not worth it. By the time I sort of got the hang of it, I was out of icing and thoroughly steamed. And when I tasted one of the ones I had done and discovered how disgusting they were, the top of my head almost blew off with a firework display that would have had no trouble showing anyone my damn colors. They may look passable in the picture, but the frosting never set up (commenters on marthastewart.com believe there is an issue with the recipe, which I’m sure resulted in some poor copyeditor being thrown into the charming Skylands dungeon), so they were untransportable anyway. I brought some popsicles to the party and swore never to craft-bake again. None of this fussy, fiddly stuff. Let’s get some rustic cornmeal cakes in the July issue next time, you know, like the colonials (probably?) made (I guess?). Let’s bake like Americans, Martha. Come on. Martha and Susan’s BFF Month! Applesauce is back in my life | Marthable on It’s all happening!